Sir Arthur Vick attended the naming ceremony of the Arthur Vick residences. Vick was Chairman of Council between 1977 and 1980 and Pro-Chancellor from 1977 to 1992. The Rootes Refectory was transformed and provided an all-day service, including a ‘cook-to-order’ grill which served Mexican, Oriental, American and British food. The 2+2 Degree Programme was launched. This was a partnership between Warwick and four local Further Education Colleges to help students with few formal qualifications gain a degree. Two years were spent at the colleges followed by two at Warwick. In June building work got underway on the Library extension which would house BP’s archives and those of the Modern Records Centre. 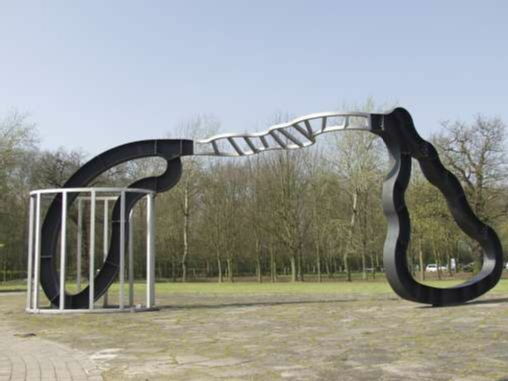 Richard Deacon studied at Somerset College of Art and in London at St Martin's, the Royal College and Chelsea College. He began exhibiting sculpture in 1983 and a touring exhibition of his work was shown at the Mead Gallery in 1987. In that year he also won the Turner Prize. Let's Not Be Stupid was Deacon's first commission for a large-scale, outdoor, permanent work. The site was chosen by the artist and in addition to making a striking contribution to its immediate architectural environment, it also serves to provoke reflection on the nature and purpose of the institution it inhabits. The work has a dialectic quality implied, for instance, in the presence of elements indicating a 'cage' and a 'bridge' or 'ladder' and in the way that shapes appear to be morphing into altered forms. It demands of the viewer the exercise of interpretative judgement and permits many alternatives. The Soviet Union was formally dissolved. The U.N. Security Council passes the Cease Fire Agreement, Resolution 687. The resolution called for the destruction or removal of all of Iraq's chemical and biological weapons, and for an end to its support for international terrorism. Iraq accepts the terms of the resolution on April 6 and UN authorizes weapons inspections in Iraq. Freddie Mercury, lead singer of the band Queen, issues a public statement confirming that he is stricken with AIDS, and the next day he dies of complications. The Films Teminator 2, The Silence of the Lambs, Beauty and the Beast, Robin Hood Prince of Thieves and The Addams Family were all released in this year.